FIXYOURTHINKING.COM / Need a brain? Borrow mine! : ParaNANOia? 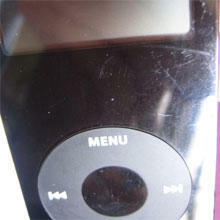 A class action lawsuit has been filed against Apple Computer over the iPod nano's suceptibility to scratches. The Red Herring reports that Jason Tomczak has filed a class-action lawsuit against Apple Computer on behalf of all iPod nano owners, demanding that customers get their money back as well as a share of the company’s profits on the music player’s sales." The complaint was filed in the U.S. District Court in the Northern District of California in San Jose on Wednesday, October 19, 2005, according to the report. The lawsuit follows numerous discussions of Nano complaints around the Web, media reports about its increased susceptibility to scratches compared to previous generations, and Apple's acknowledgement of an LCD flaw with a small set of iPod nanos. In the complaint, Tomczak says he rubbed a paper towel on his Nano front cover and "that alone left significant scratches." In addition, the suit charges that the Nano screens "scratch excessively during normal usage, rendering the screen on the Nanos [sic] unreadable, and violating state consumer protection statutes… and causing Plaintiff class members to incur loss of use and monetary damages." Of course this lawsuit will be added to the Jackwhispers Your Rights, The Law & Litigation reference section soon.